Style: twill trouser. color: navy. fabric: 100% cotton. The color is salmon pink, and the size is small. 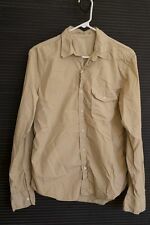 NEW Save Khaki Men's Poplin Work Shirt Small S - Light Khaki S.K.U. The color is light khaki, and the size is small. Color: Red & gray plaid. Material: 100% Cotton. Size: S Small. The color is light green, and the size is X-large. Gap Relaxed Leg Khaki Pant Sz 32X34 Mens Black New Was $59.95 Save $$$$ NWT !!!! These Gap Khaki Pants Are A Great Value !! Gap Relaxed Fit Khaki Pant Sz 33X32 Mens Black New Was $59.95 Save $$$$ NWT !!!! 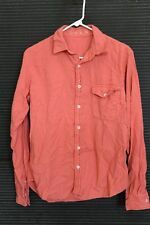 Save Khaki United Grey Chambray Cotton Button Up Shirt Size Medium, slim fit. Excellent condition, no issues. Measurements: Shoulder to shoulder- 17.5” Pit to pit- 21” Sleeve length- 25” Length (back, center of collar to hem)- 29” Shipped with USPS Priority Mail. This Item is New in excellent condition. Gap Relaxed Leg Khaki Pant Mens Sz 32X34 Black New Was $59.95 Save $$$! NWT !!!! Perfect five-pocket pants in superb cotton twill from Save Khaki SKU. Made in USA. Waist - 17.5" across laid flat. Inseam = 33". The color is slate grey, and the size is small. 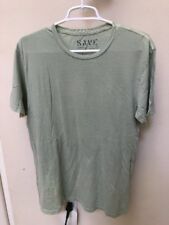 NEW Save Khaki United Medium M Supima V-Neck Tee T Shirt - White pic is wrong! Neckline: V-neck. Materials: 90% Cotton 10% Polyester. Sleeves: Short. Each item is created with a focus on superlative comfort and fit. This shirt's a great example: Perfect button down in superb, textury cotton with great buttons and a sharp cut. Perfect joggers in superb cotton twill from Save Khaki SKU. Made in USA. Excellent condition. Hook-and-eye closures along with interior button. This shirt's label was misprinted!